Walking is often the key to senior citizens maintaining their good health and precious functional independence, but loss of balance, posture and walking confidence often puts seniors on a path toward steep physical decline. Nordic walking, or walking with the aid of specially designed Nordic walking poles is proving to be a much welcomed way to immediately improve balance and posture, and restores confidence in a way that is allowing more and more seniors to put more life back in their stride. There aren’t many seniors who take up cross-country or “Nordic” skiing after retirement, but using specially designed adjustable Activator™ Exerstrider Nordic walking poles which combine the safety, convenience and simplicity of walking with the recognized health and fitness benefits of Nordic skiing is allowing growing numbers of seniors to enjoy similar health and fitness benefits whether they live in Windy City or the sunbelt. At Wesley Willows retirement community in Rockford, Illinois, more than 60 seniors showed up to hear Nordic walking pole pioneer Tom Rutlin explain how this total body version of walking works and to get some hands-on instruction. According to Rutlin, not only do walking poles aid in improving balance, confidence and providing relief for painful joints, they also help people of all ages build upper body and “core” muscles in much the same way that Nordic skiing does. The functional improvements and enthusiasm of initial group of pole walkers quickly inspired others to join in and, the walking pole community at Wesley Willows grew within months to more than 100 people. While Nordic walking has proven to be very popular with people regardless of age or ability, among the most enthusiastic users may be those who have traded in their canes and walkers for a pair of these sporty looking walking poles. Peggy Buchanan senior fitness expert from Santa Barbara, CA says, “People with canes and walkers tend to see themselves as ‘invalids’, but the very same people with walking poles more often feel like ‘athletes’”. Reducing joint pain and falls, and improving posture and walking confidence might provide more than enough reasons to try walking with poles. 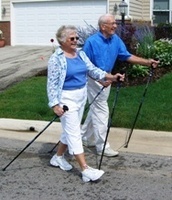 Add to that maintaining upper body muscle tone and the protection against bone loss that poles can offer as one makes walking a total body weight bearing activity, and it’s no wonder those who have tried Exerstrider’s new adjustable Activator™ walking poles say they walk more often and see more motivating results. Best of all, most pole walkers agree that using the poles has made walking fun again. Rutlin has been working for several years with retirement communities all across the U.S. to establish his popular walking pole exercise programs, and he’s been invited to do two pole walking presentations at the Sixth Annual International Council on Active Aging Conference being held December 4–6, 2008 at the Henry B. Gonzalez Convention Center, San Antonio, Texas.